Thomas Plant Hire of Holywell, Flintshire, has opted for ten new Volvo EC140E crawler excavators, thanks to the performance of two wheeled machines purchased last year. These are the first Volvo crawler excavators to join Thomas Plant Hire’s extensive and varied plant fleet, although the company did purchase a wheeled EWR150E and an EW160E at the start of last year. “We’ve been very impressed with the performance and reliability of the two-wheeled machines along with the back-up and support from SMT’s support centre in Warrington. We therefore decided to widen our fourteen-tonne sized offering to the market with addition of Volvo branded crawler excavators,” comments Managing Director, Wyn Thomas. The EC140E is powered by Volvo Stage-IV compliant four-cylinder engine developing 121 hp. The machine’s ‘integrated work-mode control’ provides high efficiency, rapid dig cycles, coupled to significantly low fuel consumption. This advanced-mode control system ensures the maximum possible hydraulic horsepower available is delivered at a constant engine speed under varying load conditions. In addition, boom and arm geometry provide highly competitive digging forces and lifting capacities, which makes for faster work cycles. For example, the maximum reach with the standard 3m dipper arm is 8.85 metres whilst the maximum dig depth is a generous 6 metres but, in particular, the lifting capacity at full reach across carriage equals 1.9 tonnes which also impressed Mr Thomas when comparing machine specifications. Hose rupture valves are fitted as standard to the boom and dipper cylinders, as are quick-fit hydraulics and a hammer/shear service. 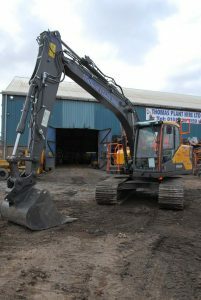 The new arrivals will be deployed from Thomas Plant’s depots located at Holywell and Widnes and available for general hire. 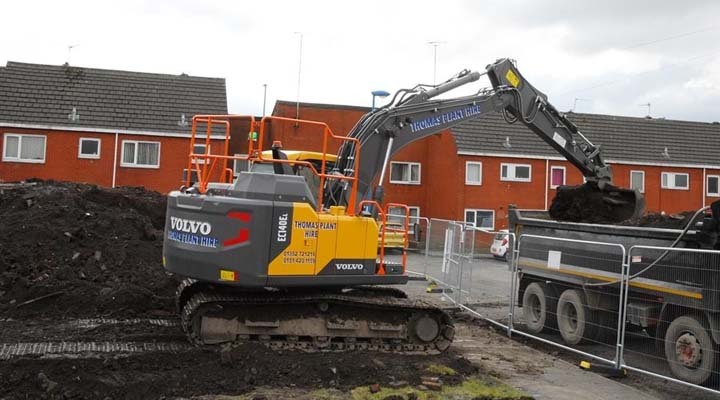 The family-run business covers the whole of the north-west of England including Greater Manchester, Merseyside, Lancashire, Cheshire, north and mid Wales and offers a highly comprehensive fleet of equipment for spot, medium and long term hire.